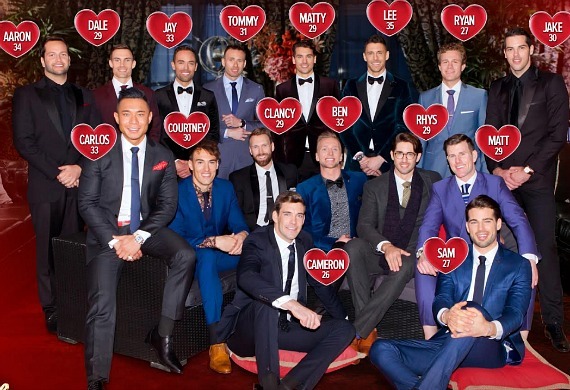 These are the 16 single men vying for the affections of journalist Georgia Love, in the new season of The Bachelorette. TEN has revealed the men ranging in age from 26 to 35, who will feature on the second season of the reality show later this month. “You can have the butterflies with the fireworks and fairy lights, but if you can strip all that back and still the get the butterflies when that person walks through the door, that’s what I want. That’s what I’m looking for and I just hope that person is going to step out of the limo,” said Georgia Love. Georgia will welcome these desirable men into the Bachelorette mansion for glittering cocktail parties and also invite them to take part in a series of memorable dates, ranging from the high-adrenaline to the heartfelt. Queensland is the state best represented, with six Bachelors hailing from the Sunshine State: marketing company CEO Aaron, medical sales rep Clancy, personal trainer Dale, sales professional Jake, entrepreneur Rhys and employment coach Tommy. Miner Ben, industrial designer Courtney, marketing manager Matty J and electrician Sam are the four Bachelors from NSW. From Victoria we have entrepreneur Carlos, mechanical plumber Lee and security specialist Matt D.
Firefighter Cam and sailing coach Ryan have crossed the Nullabor from Western Australia to look for love. And wellness coach Jay is our South Australian Bachelor. The Bachelorette Australia promises to be one of the most exciting and romantic television events of the year, one will have the country tuning in to follow Georgia’s journey to find love. Wednesday 21 September at 7.30pm on TEN. I’m hooked already. So much more interesting than the Bachelor. Oh, great, more guys. It’s gonna be another Wil Wheaton sausage-fest.